Not long ago I ran across an item on You Tube that conveys an overtly negative message about my church in general and my prophet in particular. The nature of the video – a segment from a General Conference Session with sub-titles – although the stimulus of my thoughts here and the seeds of inception of this blog, is, in reality, irrelevant. What really caught my attention, however, was the volume of venom and vitriol spewed into the discussion group that was attached to the video. 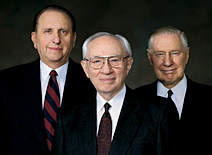 A great deal of antipathy and ill-wil l came out on both sides of the argument – the Mormon apologists contributing to the discussion were in many cases equally as negative and divisive as those who were having a field day attacking the money-grubbing church and doddering old men who so self-servingly lead it – this particular 94-year-old spiritual leader in particular. I couldn’t help but remember the words of a loving Father: “…if ye are not one, ye are not mine” (Doctrine and Covenants 38:27). Running through my mind as I read so much discord in the name of religion was the thought of the many times that God has told us through His servants to avoid contention and strife. Somehow out of this cacophony of the mean-spirited disputations came the idea of creating this Web forum. I have long enjoyed writing down my thoughts and feelings, but have always found the distribution of my writing to be a problem. Digital technology makes that easy now. Your thoughts and opinions are welcome: if you disagree with my views, that does not make your thoughts and views wrong. I have even been known to change my mind on occasion. Although all of us seek truth – or should do – but I have not yet been granted a corner on that market. I only do the best I can. However, a civilized exchange of ideas and discussion of differing viewpoints need not devolve into ad hominem attacks and ridicule of the thoughts, feelings and beliefs of others. I hope you will respect that as you respect my feelings while you are in my digital home.